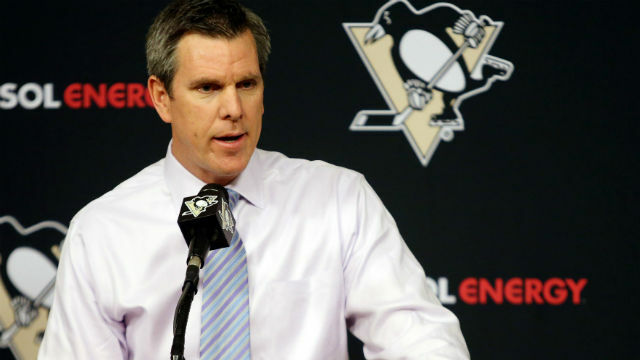 December 12, 2015: After a less consistent start to the season, the Pittsburgh Penguins fired former head coach, Mike Johnson and brought in (former Wilkes Barre- Scranton head coach) Mike Sullivan to take the reins. Through no amount of hard work (and the occasional swear word), Head Coach Mike Sullivan (as well as impressive roster moves by General Manager, Jim Rutherford), took this team from the basement of the Eastern Conference to playing the Eastern Conference finals. Though multiple injuries to star players plagued this team all season and through no small amount of strife, the Penguins made it through every obstacle they faced including a grueling month of March and 2 hard fought playoff series. The team now faces their biggest task yet…fazing off elimination late in what has been a magical (and somewhat miraculous) playoff run. The Penguins will be eliminated from the playoffs unless the whole team plays. This includes the stars. Now before you go after your torches and pitchforks, remember this: although stats may be individual, it is still a team sport. It still requires team effort. The “HBK Line” has been nothing short of brilliant and what more could be asked of Matt Cullen, Bryan Rust or Patric Hornqvist? But those aren’t the names that should be standing out. They aren’t the leaders. 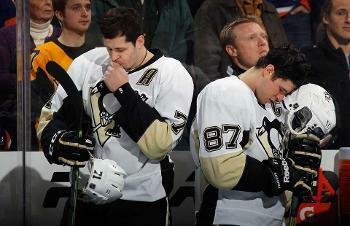 Sidney Crosby, Kris Letang and Evgeni Malkin are. Sidney Crosby is still struggling and the issue with who to put on his wing on the top line is more than slightly annoying. Conor Sheary has cooled off but you really can’t fault the kid for it. He isn’t used to this type of deep playoff run or the minutes that were going to be asked of him to play. It is just very unfortunate that the fatigue is hitting him at this moment. Beau Bennett played in his place Sunday after being out (again) to injury, but was basically non-existent the entire game. Then again, so was Kris Letang. The past two games have not been his greatest. In fact, they have could be considered some of his worst. His temper ran out of control in Game 4 which ended up costing the Penguins the game and he is making poor decisions. He also is hesitant to shoot the puck. He ended Sunday night’s game a minus-4. This simply will not do and only Kris Letang can control what happens next. The Lightning are gunning for him. He knows it. Coach knows it. I know it. The dog down the street knows it. Now it is time for the other five defensemen to up their game to lunatic level and take some of the work load off of Letang. Make the heavy hits, be a little agitator (but know the limits), win the battles along the boards to get the puck out of the defensive zone. That way some scoring chances can be made. Maybe even take a few shots of their own when they see an opportunity as well. All in all, the defense has to bring everything that have. Bear down, get after the puck and the opponent who has it, make good defensive plays to strip the puck from that opponent and get it deep into the offensive end. Getting into those shooting lanes when in the defensive zone and blocking shots make a difference. Leaving your goalie out to dry does not help matters. They can only stand on their head so much. But who is in net? Who will be the starting goalie? Is it Marc-Andre Fleury or Matt Murray? When will Coach Sullivan tell us? WHO…CARES? No, Fleury didn’t have a great game. He didn’t have an atrocious game either. The rust was obvious but you would be rusty too if you did nothing but practice for 2 months after having your bell rung. Murray, like Sheary, is tired and I had a feeling that would happen. So why is everyone complaining about putting in the number one goalie? He is and has been the number one for a reason. Be it MAF or Murray, whoever is in net is NOT going to matter if the Penguins play the way they have been the last two games and can’t defend a lead. The debate is old hat. Talk about something else. I know, let’s talk about Evgeni Malkin. Can someone please put out an APB on our MVP? He has had a few good looks and got the assist on one of Chris Kunitz’s goals, but in his last 22 playoff games, Malkin has only 4 goals and only 9 assists. There is something very troubling going on there although, I admit, I can’t put my finger on what it is. It's worse than ever this year. If I had to guess (and at this point that’s all we can really do), I’d say he is playing hurt. More than just a “take-an-Advil” or “numb it up and play” kind of hurt as well. Actions speak louder, Malkin. Don’t just say it, do it. This is the time to be selfish. Put your shoulder down and make a lane, get defenders out of your way. For lack of a better example; be a line backer on the ice. Now is the time these stars need to shine along with their supporting cast, not be out worked and out-shined by them. The power play (oh lord, that power play) and scoring chances are a huge deal. I have heard it over and over: That so-and-so is looking for a pretty goal. STOP IT! For the love of all that is good, please STOP. At this point, any goal is a “pretty goal” because it puts points on the board. Take the shot and get someone in front of the net and down in the crease to get the rebounds. Those second, third, even fourth attempts are the ones that will make a difference. Not one player is above a little grunt work. That 50-foot shot from the blue line is great when it results in a good bounce that can be shot on the net. It does not help when it ends up easily blocked and taken down the other way on an odd-man rush. The Penguins know how they CAN and have to play. They did it against the Rangers. They did it against the Capitals- the best team in the regular season. Clean passes, limit the amount of time dancing with the puck, puck possession/control and take shots…all shots…whenever and wherever they can. More traffic in front of the net means more of a chance that puck will find twine. Resiliency has been the word of the year. The Penguins now have an opportunity to show what they are really made of. This is where you lay it all out on the ice. Grit isn’t just for a bottom-6 grinder, it’s for everyone. Show us that you want it as much as we, the fans and columnists and reporters and bloggers and all of Penguins Nation, want it for you. WE BELIEVE! Now show us that you do to!